The time for spring cleaning is near and the remains from a harsh winter are still here. Look no further than AAA Sweeping! We offer a variety of services that are the perfect answer for your outdoor cleaning needs. Parking lots and streets no longer need to remain cluttered by leftover sand and gravel from our snow-filled past. Here are just three of our services that can help you clean up this spring! Looking for a pleasant method for maintaining the parking lots and sidewalks of your business? Loud noise and flying dust are not a factor when our silent and dust free Nighthawk Trucks are put to work. Likewise, our water trucks handle a variety of tasks requiring wash downs and water deliveries, ideal for washing away and controlling the disruption of loose dust and debris. Have build-up in your drywell? Drywell maintenance is crucial this time of year due to the harsh build-up of sand and gravel. Taking the necessary steps can prevent clogging and inadequate drainage. 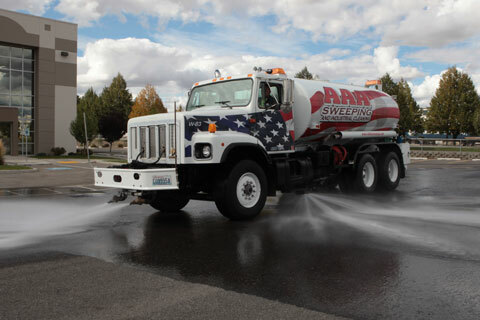 Our AAA Sweeping Industrial Vacuum trucks can take care of the most challenging clean-up projects in anything from drywells to sewer pipes, using a combination of high water pressure and vacuuming. Spring cleaning starts with AAA Sweeping and our dedication to provide quality results and customer satisfaction with every job. Call AAA Sweeping today!